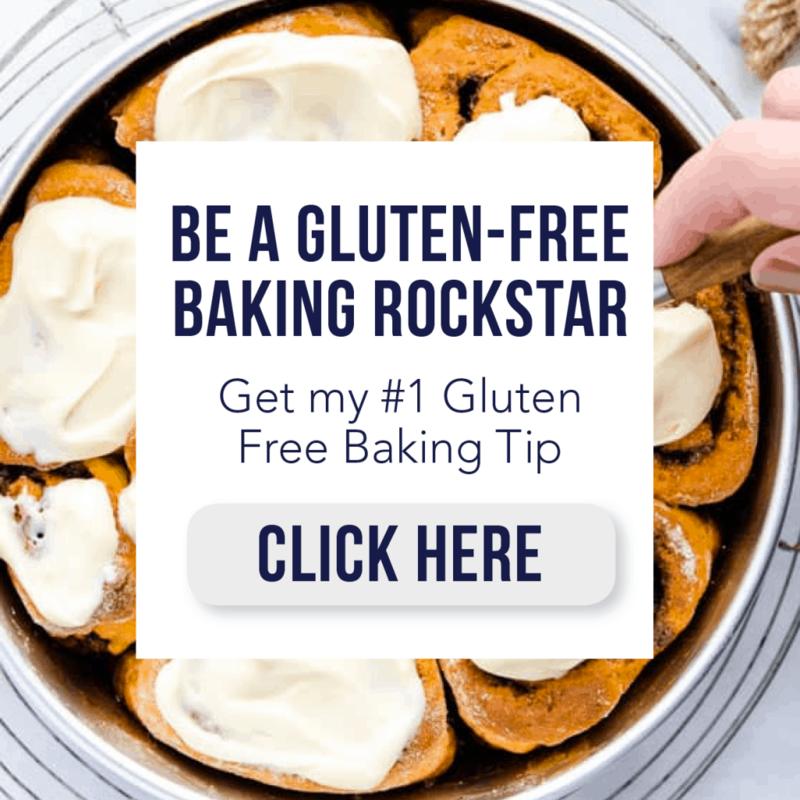 My favorite gluten free banana bread recipe – this easy recipe will be one you make again and again. It’s the perfect recipe for over-ripe bananas. 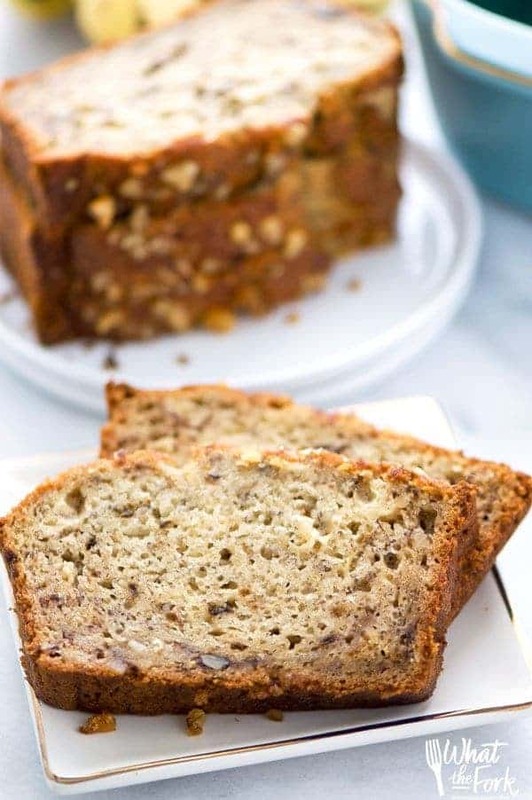 One of the very first recipes I posted when I started this blog was for gluten free banana bread. At the time, I thought it was amazing. Over time, I slowly continued to adapt it and it has evolved into one of my very favorite quick breads. The base of this gluten free banana bread recipe helped me develop the recipes for my double chocolate banana bread and my gluten free pumpkin banana bread. I’ve also got several other versions of this simple banana bread recipe with oil that I haven’t shared on my blog yet – all from this one delicious base recipe. I’ve mentioned before how I always ALWAYS have over-ripe bananas. It’s a blessing and a curse. I will only eat bananas when they’re just barely ripe, even still a bit green around the top and bottom. As soon as there’s even just one little speck of brown, it’s too ripe so I’ll let them sit until they’re ripe enough to bake with. I feel like I’m always baking with bananas! That’s not always a bad thing though. That means I’ve baked dozens upon dozens of this super moist banana bread over the years. And even with all those homemade banana breads, we still haven’t gotten sick of it. That just goes to show just how good this easy gluten free banana bread is! Step 1. Combine the dry ingredients into a large mixing bowl. Step 2. Whisk together the dry ingredients. Step 3. Add nuts to the dry ingredients and whisk together. Step 4. In another large bowl, add the wet ingredients and whisk together until well incorporated. Step 5. Add the wet ingredients to the dry ingredients. Step 6. Stir these ingredients until combined. Step 7. 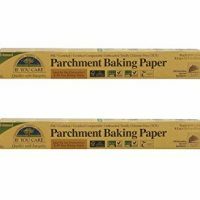 Transfer the batter into a prepared pan ( 9×5 loaf lined with parchment paper or use non-stick spray). Step 8. Add chopped walnuts on top of the batter (optional). Bake at 350 for 50-60 minutes. I’ve also made this recipe many, many times with regular flour and regular milk. I often make this for my husband’s grandparents and my next door neighbor that way since they don’t have to eat gluten free or dairy free. 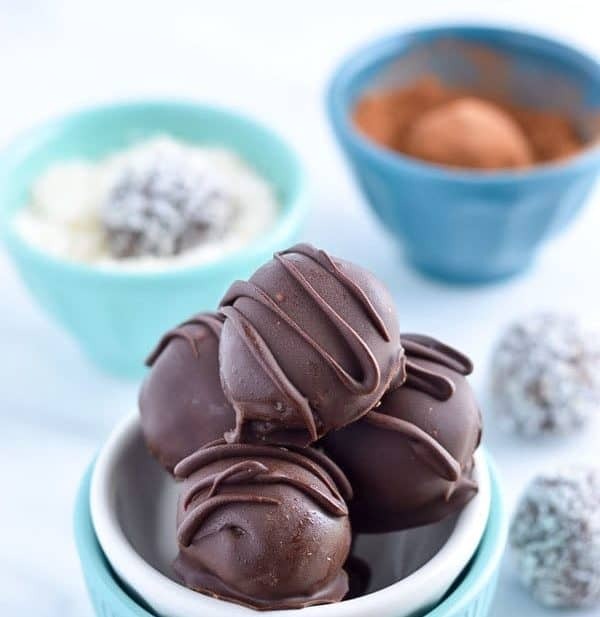 It’s really great that way too so if you don’t have to eat gluten free, you don’t have to pass on this recipe! And just for the record, I think I might subconsciously buy too many bananas all the time just so I have an excuse to make this best ever banana bread all the time. Enjoy! 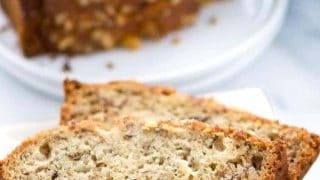 My favorite gluten free banana bread recipe - this easy recipe will be one you make again and again. It's the perfect recipe for over-ripe bananas. 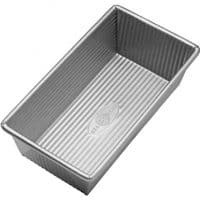 Preheat oven to 350 degrees and spray a 9x5 inch loaf pan with non-stick spray. 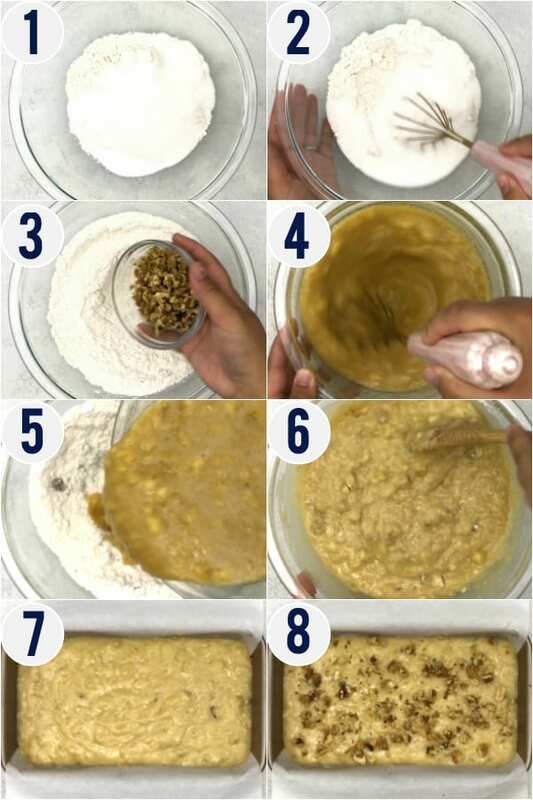 In a large bowl, whisk together the flour, xanthan gum, baking powder, baking soda, salt, granulated sugar, and brown sugar. Break up any clumps of brown sugar if necessary. Stir in the chopped walnuts. In a separate bowl, whisk together the oil, eggs, milk, mashed banana, and vanilla extract. Pour the wet ingredients into the dry ingredients and stir to combine. Pour the batter into the prepared loaf pan and bake at 350 degrees for 50-60 minutes or until a toothpick or cake tester comes out clean. Cooking time will vary depending on your oven - mine is usually done around 55 minutes. Cool the bread in the pan on a cooling rack for 15 minutes then remove from the pan and cool completely on the cooling rack. To store, wrap tightly in plastic wrap and store in a zip-lock bag. It will stay fresh up to 3 days. This bread also freezes well. Wow, this truly is a perfect loaf! I have ripe bananas just waiting to be used and this bread looks incredible! I need to make a batch to eat throughout the week. Gotta love banana bread! This looks amazing! Yum! We are huge banana bread fans in our home. This looks so good! I wish I had some this morning to eat with breakfast! I have been drooling over your banana bread! I like how you swapped out the potato starch, potato allergies are one of the fastest growing. I love banana bread! I am always looking for new recipes to try! I am excited to try this one! I have some bananas ripening quickly, this will be perfect! I’ve been craving banana bread. Can’t wait to try this GF version! This looks… sosososooosoo good! 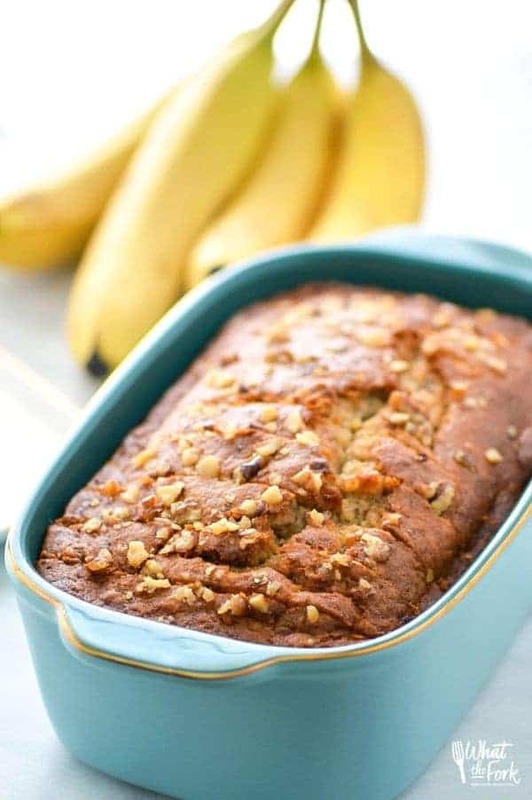 There is seriously nothing more comforting that a warm slice of banana bread with a big slab of melted butter! That loaf pan is ridiculously cute!! Love how healthy this is and the chopped nuts! 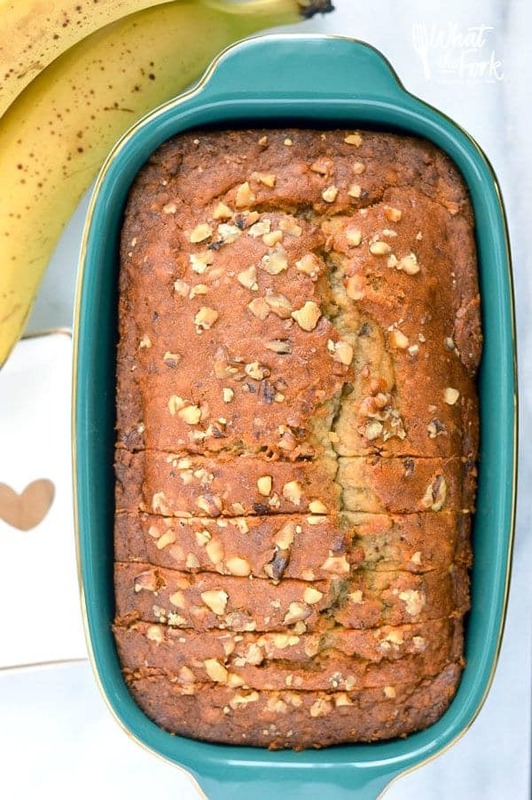 I love everything about this banana bread!!! Looks and sounds SO delicious!! Gorgeous! And I NEED that bread pan! So pretty! I have always been weary of gluten-free banana bread because it’s always so rubbery and thick. This literally looks like normal banana bread! Excited to try this out! Baking with avocado oil = yeah, that’s happening! It’s my favorite oil for baking now! I’m new to GF. What is xanthan gum and where do I find it? Also, can coconut oil be subbed for the avocado? Hi Shirley – I haven’t tried this recipe with coconut oil, but if you prefer it you can use melted coconut oil. It will change the taste of the banana bread though. Xanthan gum is necessary in a lot of gluten free baking recipes to help the flours bind together. You can usually find it in the gluten free section at your grocery store. 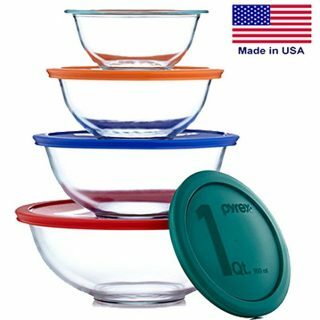 If your store doesn’t carry it, you can get it on Amazon (affiliate link): http://amzn.to/2mt3yMe (I use Bob’s Red Mill). It’s in the oven right now and the kitchen smells amazing! I am sure it’s a success! Banana, coco milk, wonderful mix! I am also new to gluten free, but I’m wondering if I can use corn starch instead of the xanthan gum as I’ve read online it is a good substitute. I’d also like to use almond milk instead of the coconut milk. Thoughts? Hi Vanessa – I haven’t heard of cornstarch acting as a replacement for xanthan gum. I would not recommend trying that in this recipe as the xanthan gum really helps the gluten free flours bind together to act like wheat flour. As far as almond milk goes, that’s up to you. I prefer baking with unsweetened coconut milk because I don’t like the nutty taste that almond milk lends to baked goods. For me, it overpowers the flavors of whatever it is I’m baking and makes everything taste nutty. I find that unsweetened coconut milk does not give baked goods a coconut flavor. This looks Awesome. I will be trying it soon. One question though… Where can I get that loaf pan?? ???? I got it at Target! I made this last night and it is ah-mazing!!!! I have tried many gluten free recipes, only to be disappointed by the results. Finally, one that works. 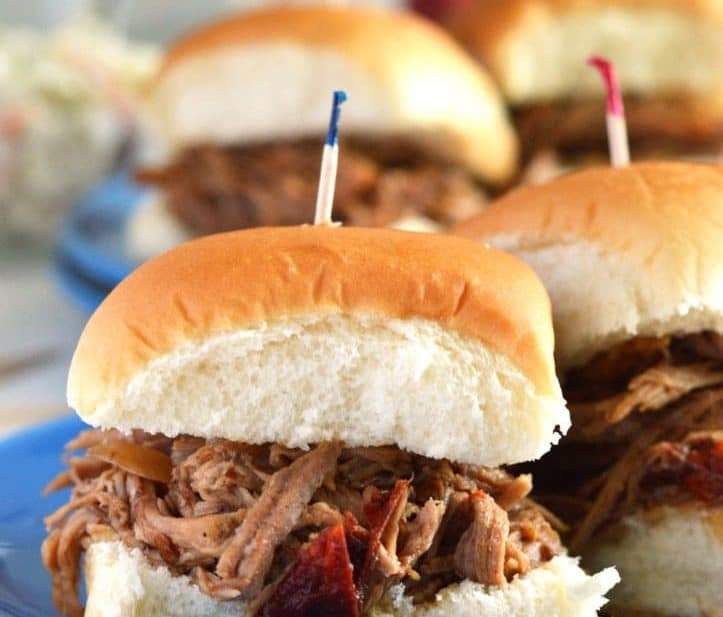 Popped out of the pan with ease, cooked evenly, moist and delicious! Thank you and I will be trying out more of your recipes. 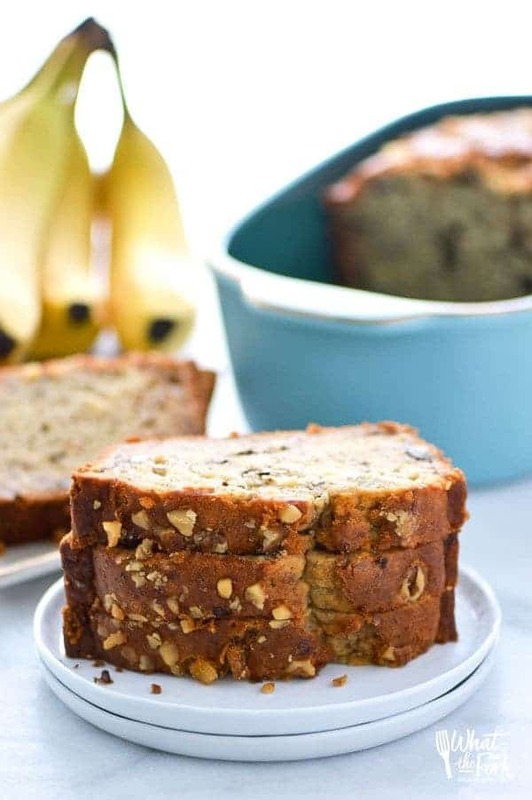 Yay Karina – so glad you finally found a banana bread you enjoy! My daughter also has allergies to eggs. Will applesauce change the outcome of this bread success? I haven’t tried this recipe with an egg replacer but if you do, please let me know how it turns out! Very good bread! I used only half of the sugar and substituted coconut sugar for brown and regular sugar. Still bread came out sweet. Next time I will try to use even less sugar. I guess that depends on the personal taste. Denifitely a keeper! I haven’t tried it but I think it should work since it’s a pretty moist bread. If anything, you may need to add a couple tablespoons of extra milk but you might not need to. I just made this and it is truly amazing! 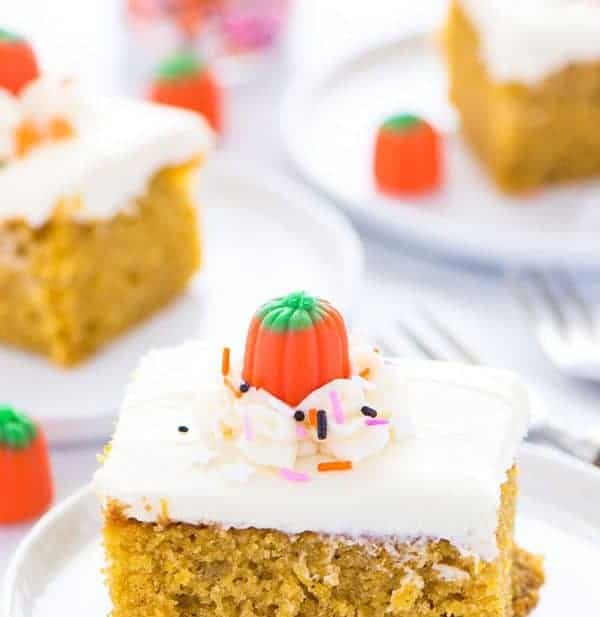 So moist and delicious! You wouldn’t even know it’s GF. Sharon, yours is my Go-To GF banana bread recipe. My grandmother still doesn’t know it’s GF when I serve her your recipe. :)) Thankful for your site !! 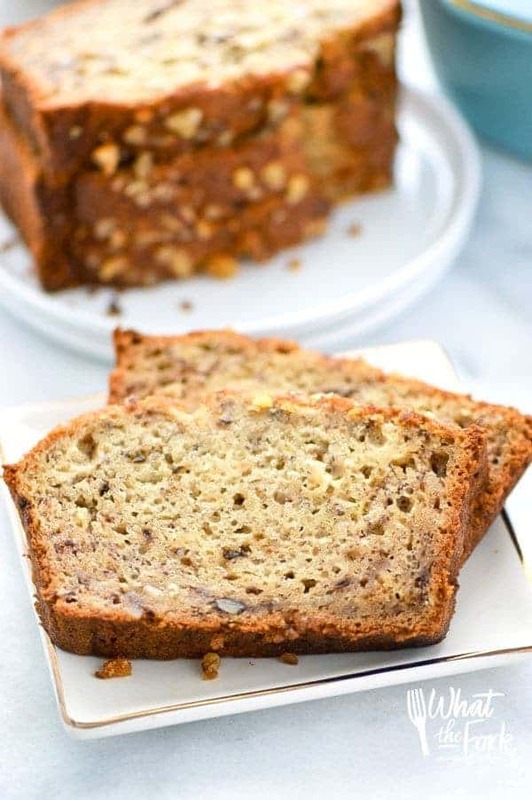 It is definately the best banana bread that does not become too dense after the first day. I used buttermilk and added some lemon zest along with a few raisins. Next time I will use half the amount of sugar as it was a bit too sweet. Thank-you for sharing your recipe. 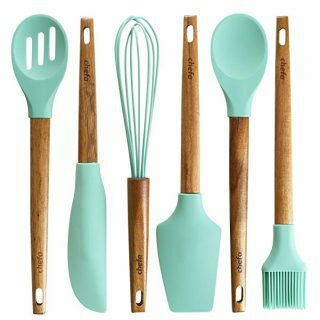 Lemon zest sounds like a great addition! I’ve never used jaggery and am not familiar with it. Sorry! Made this banana bread yesterday, for my gluten free grand children. I was amazed at how it looked just like one made with reg. Flour. It tastes great as well ! Thanks! Thank you Pauline! I’m so glad that you liked it so much. Thank you for sharing! Can you recommend a brown sugar substitute? I’m trying to use refined sugar alternatives whenever possible. Thank you so much! I sometimes use coconut sugar in place of brown sugar. It may yield slightly drier baked goods though. Can you use gluten free flour premade from the store? I’m thinking of making it for a friend who needs a GF meal. You can, I would recommend Bob’s Red Mill 1:1 Gluten Free Baking Flour (in the blue bag). If the blend you get (like the Bob’s Red Mill I suggested) contains xanthan gum, omit the amount I called for in the recipe. My Mom is not Gluten-Free, and I have brought her several slices, several times and she loves it too! Thanks so much for the wonderful feedback Deirdre! Thank you for this recipe. This was the best banana bread, better than any other I’ve made. Thanks Kim, so glad you enjoyed it! 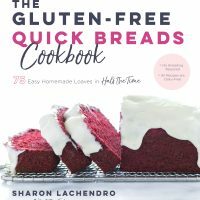 I wrote an entire chapter in The Gluten Free Quick Bread Cookbook based off of this recipe – I’d love for you to check it out! I always have ripe bananas in freezer, usually we use them for smoothies but I can’t wait to try this recipe!